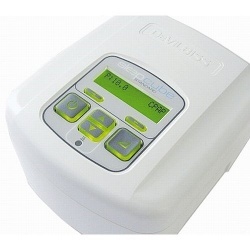 The DeVilbiss SleepCube Standard is a fixed pressure CPAP device designed for the effective treatment of Sleep Apnoea. The DeVilbiss SleepCube Standard can be used in the home, while travelling or at the hospital. Sleep is incredibly important for your emotional and physical well-being and getting regular, quality sleep plays a crucial role in leading a healthy life. Sleep disorders negatively impact the quality of sleep including those who are living with untreated or undiagnosed Sleep Apnoea. Effective and ongoing CPAP treatment for Sleep Apnoea allows you to get the healthy night's sleep you deserve. With the DeVilbliss SleepCube Standard you don't have to stop your CPAP therapy just because you're travelling. The multi-voltage capability of the DeVilbiss SleepCube Standard means that it can be used virtually anywhere in the world. It can also be operated from a 12V DC power source such as those found in a motor home, recreational vehicle or boat. The optional heated humidifier (available to order separately) integrates seamlessly into the system. The DeVilbliss SleepCube Standard CPAP machine is designed to stop the air passage from narrowing or completely collapsing during sleep, with the continuous flow of air from the device creating a splint which keeps the airway open. As the airway is kept open, breathing is completely normal and there are no interruptions to sleep. Can I use my SleepCube in a motor home, vehicle, boat? As a patient, can I make changes to my CPAP pressure? The SleepCube range of CPAP’s are only available with a prescription from a sleep physician. The pressure that your SleepCube has been set to will have been tailored to your requirements as determined by sleep screening tests. Any pressure changes should be made by your physician upon reassessment. Do I need a voltage converter to use my SleepCube in a foreign country? A voltage converter is not needed because the SleepCube range of CPAP's have a switch-mode power supply, which automatically adjusts to voltages from 100-240v and 50-60Hz. It is, however, necessary to purchase the correct mains lead for the country you are travelling to. I intend on travelling, will I require my SleepCube to be re-adjusted for large changes in altitude? My doctor has advised that I need to have supplemental oxygen at night whilst receiving my CPAP therapy, is this possible? Yes, supplemental oxygen can be added with the optional oxygen adapter attached between the unit and tubing or if the mask is equipped with an oxygen port directly to the mask. What mask should I use with my SleepCube CPAP? The SleepCube can be used with any vented mask. The success of CPAP therapy is often dependant upon the comfort and fit of the mask so it is important to have a wide choice. Most suppliers of sleep therapy equipment have a range of masks available including nasal masks, full face interfaces, nasal pillows and mouth only masks. What length of tubing can I use with my SleepCube? I experience a sore, dry throat and nose. Is there anything I can do? The most common solution is a heated humidifier. This is a device that fits to the CPAP to heat and moisten the airflow making therapy more comfortable. The SleepCube Range of CPAP's has an integrated heated humidifier available as an accessory. For more information and advice please refer to your sleep specialist.